Easterbrook (A Moment on the Earth, 1995), a journalist, believes that the biblical God, interpreted as a deity in progress, provides sophisticated secularists with a reason to read the Bible—but his own highly selective and simplifying reading of that ancient text will engage few who know it more than passingly. At a time when biblical scholars such as John Dominic Crossan, Raymond Brown, and James Kugel are publishing major works of biblical interpretation for wide, nonspecialist audiences, it is the bold amateur indeed who claims, as Easterbrook does, to “propose a new understanding of Western scripture.” The author acknowledges a predecessor in Jack Miles, whose popular book, God: A Biography, takes the biblical God for an analyzable literary character. But Easterbrook aims at more: to rethink the Bible for the spiritual use of jaded secularists, whose Freudian, materialist, and scientist culture has all but blinded their religious senses. 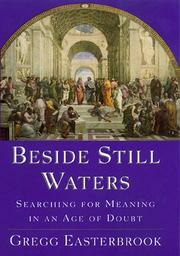 The first few chapters summarize the origins of modern doubt; the middle ones argue for a less than omnipotent God, whose slow progress from wrathfulness to love models the proper course of human growth; the final chapters crystallize the book’s central theme, that spiritual progress is always away from institutions and rites toward neighborly love. Easterbrook reads much into the Bible’s failure to declare God omnipotent; but that silence is less an oblique sanction to humanize the divine than a sign of how little interested the biblical writers were in abstract metaphysical concepts. The larger difficulty with a progressive view of the biblical God is that it must ignore too many countervailing passages: already mercy is stronger than wrath in the early Exodus version of the Ten Commandments, and wrath is rampant in the late New Testament book of Revelation. Literary interpretations of the Bible are always welcome; but the Bible as literature is too complex comfortably to sport the evolutionary straitjacket Easterbrook has prepared for it.